Mercedes-Benz E300 BlueTEC Hybrid and Volkswagen Jetta GP local assembly to begin in November? Home » Local News » Mercedes-Benz E300 BlueTEC Hybrid and Volkswagen Jetta GP local assembly to begin in November? We saw something interesting in DRB-Hicom’s Annual Report 2014 which was released earlier this month. 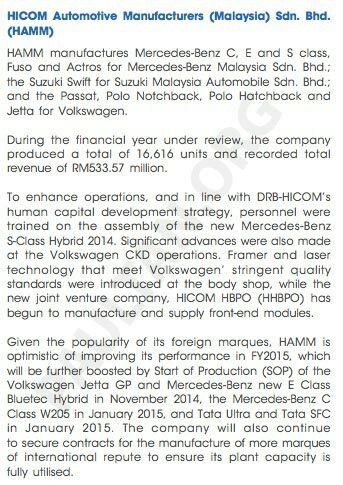 Look at page 93 for the section on HICOM Automotive Manufacturers (Malaysia) Sdn Bhd. HAMM operates a plant in Pekan, where foreign makes such as Mercedes-Benz and Volkswagen are assembled. There’s a list of future models that are expected to be locally assembled along with their expected Start of Production dates. I’ll list only the passenger cars here, as there are commercial vehicles listed as well. The E-Class Bluetec Hybrid is an interesting car. This is not the first time we’ve heard of this car coming to Malaysia. Back in August, a sales advisor posted an ad for it on our classifieds site oto.my in hope of getting some pre-launch bookings. Under the hood is a 2.1 litre four-cylinder turbodiesel engine with 204 hp and 500 Nm, paired to a 27 hp electric motor installed in the 7G-TRONIC gearbox in place of the torque converter. The big exec is no slouch, doing the 100 km/h sprint in 7.5 seconds, but the main selling point here is the combo of the diesel engine and electric motor, which results in a claimed combined fuel consumption of just 4.3 litres per 100 km. The E-Class Bluetec Hybrid should qualify for 100% duty exemptions under the new NAP just like the S 400 Hybrid. If that’s true, expect an incredible pricetag, or super high equipment levels, or perhaps both at the same time. If the Start of Production date is accurate, it means Mercedes-Benz Malaysia will have just over a year to sell this car until the incentives expire at the end of 2015. We already know the new W205 C-Class – which was launched as a CBU first as a C 200 Avantgarde and C 250 Exclusive – is expected to be locally assembled, but at least now we have some kind of timeline of when the CKD version of the C-Class will be rolling out of the plant. We’re not 100% sure what the Jetta GP is, but given that the URL slug for the facelifted Jetta on the Volkswagen UK website is “jetta-gp”, we reckon it should be the Jetta facelift. It’s already been sighted in Malaysia a couple of times, though those units are probably CBU cars brought in for evaluation purposes. We contacted VGM to clarify if “Jetta GP” referred to a facelift and the official response is that there are no plans to facelift the Jetta CKD at the moment. 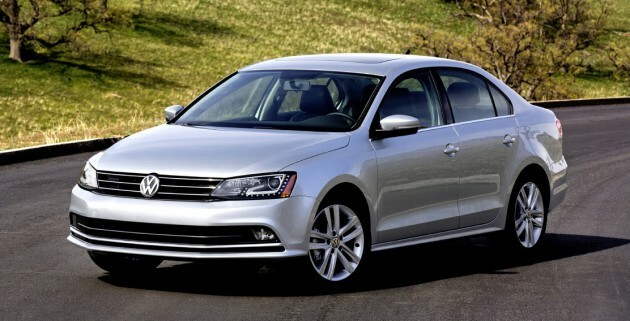 Anyway, there are currently some promotions going on for the pre-facelift CKD Jetta if you’re interested. Of course, we should assume that this information is subject to change and are only accurate up to the date that the annual report was published. You know that term – best effort basis? But while the dates may move around, the car themselves should be coming, since there’s some lead time required in CKD planning and the mentioned Start of Production dates are very close now. Anyone can afford it here? if boleh people can not afford to buy export lah..
Will get my w205 c200 for next 2 weeks. Not sure to choose palladium silver or brilliant blue. Also, it is good for a merc to put BMW plate on it? Thanks..
this post talking about CKD. Nak Bergaya.. Syiok sendiri aje..
You need to choose and confirm the car color first then only the dealer will arrange a car for you, right? And the luxury car owner normally will up front tender a nice car plate number already, seem you are not prepared at all..
You were right. I just tendered BMX. Thanks. Palladium silver looks more stunning.. Kinda strange for a merc to use BMW plate but its up to you to do so..
At VW GP is short for Große Produktaufwertung (big product upgrade/improvement), which basically means facelift. I wonder why there are no upcoming affordable cars with hybrid drivetrains… a Golf hybrid for example could be very affordable, likewise a Prius (C) hybrid if CKD in Malaysia – though Toyota depends too much on sales of their regular cars, and understandably wouldn’t want to hurt their sales with a hybrid they can only sell in limited quantities. I think doing CKD hybrids is mostly interesting for less popular brands in Malaysia that would not run the risk of cannibalizing sales. Say a hybrid Renault Clio, if such a thing exists, could be CKDd in Malaysia. No tax means instead of 90-100k it could cost around 50-60k, and Renault wouldn’t be worried about hurting sales of their other cars… they don’t have any. The E class Bluetec, well that ought to be interesting. Very curious to see how the pricing is going to be, and how will BMW respond. Audi is currently in a game over stage as they don’t have the A6H anymore, and the A6 is a bit… it’s OK on it’s own but in the competition, not so. Will the E Bluetec steal the sales of the E250, E200 and the 520i/528i? Unlikely. Why? Diesel. Whatever said and done, when you are putting down over a quarter of a mil. or even nearly half a mil on a car, the last thing you want is uncertainty that the fuel will kill the car. Unlikely, as witnessed by the 520 and 320d’s strong reliability, but still, perception is difficult to be changed. Yeah it will be very interesting to see how MBM will price this E300 and if it follows its S400 Hybrid big bro foot steps, it will come with high spec at a good price…I’m not surprised if this baby will be priced like how the A6H was before. The timeline for the CKD W205 is also quite interesting…MBM trying to get it out before CNY 2015 by the looks of it. Wonder if they will add a bit more spec to the CKD models. The C200 should have true keyless entry like the C250 and both cars should have adaptive LED lights like how they were before with adaptive xenons. What if we suddenly have educated and non greedy/corrupted Malaysian, that’s willing to move into development state and introduce at least Euro 5 fuels? In eons to come la. Current state? nah.. dont think so. Anyone who’s using the 3 or 5 series diesel car can comment on long term use of our low quality diesel? While the price and equipment level of this new E300 is gonna be impressive, using our mediocre diesel worries me. Any input? just drop a visit to bmwclubmalaysia forum for the diesel models reliability. other than normal wear and tear and regular servicing, there’s no problem running the car for the long term. i have mine for 2 years (f30 320d). some own the e90 320d for over 4 years..